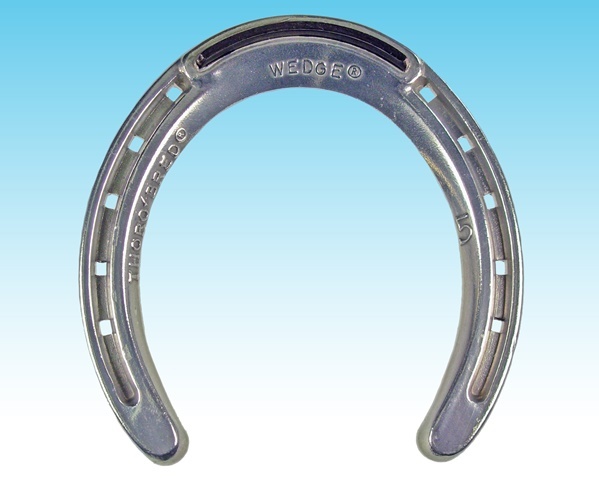 The WEDGE HIND has elevated heels that are raised by 1.5 degree and helps to support run down heels or other reasons that the farrier deems necessary. The toe grab is raised .205″ (5.2mm) above the surface of the shoe. All of our toe grabs are made of heat treated tool steel for durability and long wear. All of Thoro'Bred racing plates and competition shoes are made from prime aluminum to military specifications, aircraft grade quality. No secondary material is used in any of their products. They guarantee the finished products to meet those aircraft quality specifications. Thoro'Bred racing plates and shoes are hot forged and heat treated to meet every requirement in racing or competition.